If you do magic of any kind, you will sooner or later need to purchase several silks for your effects. 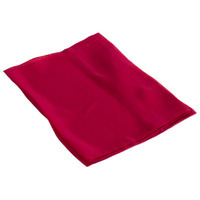 Dont use handkerchiefs as a replacement for silks. They will not work. Handkerchiefs will not fit into a Thumb Tip and they do not work well with other magic routines. Magicians use silks for a reason. Silks are easy to slide around and compress into a very small size. Ive use handkerchiefs as a replacement for silks before and I know. Dont use handkerchiefs as a replacement for silks. Buy the silks you need, they are not that expensive. Whenever you make an order with Penguin Magic, throw in a color silk of your choice because they are inexpensive and you will eventually use them. If you dont have any silks you will be unable to perform some magic routines. Keep track of the colors that you buy and over time you will have a good collection of various colors to use in your magic. Penguin Magics silks come in a variety of colors: Hot Pink, Orange, Purple, Lime Green, White, Aqua, Gold, Black, Blue, Green, Yellow, and Red. The choices of colors are a personal choice. The two most common sizes of silks used in magic are 9 and 18. Penguin Magic sells both sizes. The 9 silks are used in Thumb Tips, for coin magic, card magic, etc. You will use the 18 for silk magic routines and other various magic routines. Buy both sizes of silks because you will eventually need both sizes and they are inexpensive. One reviewer mentioned that they were a bit too thin. Yes, that is true but all magic silks are thin. Magic silks are supposed to be thin. This allows them to compress into a small size in order to fit into your Thumb Tip. Penguin Magic sells the silks you will need in a variety of colors and in the two most common sizes (9 and 18). Buy some silks now. I would also suggest that you purchase several Vernet Classic Thumb Tips to use with your silks. Both are inexpensive and as always, you get Penguin Magics free shipping. The silk is a needed tool for the magician. I don't ever do a show without a silk in it. Why spend time trying to cut and sew your own silks when these are so cheap and great? Great construction, these silks last forever and a day! What can I say, Gosh silks and sponges have never disappointed me yet, great quality, probably why they go out of stock every so often, Defiantly add to cart!! We all need silks for one thing or another. These 18" silks are a great value. They're well made and a great purchase for $2.54. Don't just order one...get multiples because as I stated earlier, you'll need them eventually. These a very nice silks that are fantastic for a multitude of tricks, however if you need to conceal a gimmick, the Vernet Mini zombie for instance, the silk will be too transparent to properly hide things. Aside from that these are perfect and reasonably priced silks. I'll keep it short and sweet. I almost never complain about any magic things I buy but I really am disappointed with this silk. It's just way too transparent. I expected a higher opacity. If there is any light behind you AT ALL or a bright light shining on it (so, in other words, any light at all) you can pretty much see straight through it. Not really what one would hope for in a silk. The worst thing is that I bought 2 of these bad boys. It is a great silk! I love the price and I love the silk. I use it with my Silk to Egg routine & am very happy with it!